The Academy’s Annual Fellows’ Meeting took place on Thursday 3 December and included the AGM, the Foulkes Foundation Medal Award and the annual Jean Shanks Lecture. This year's AGM was attended by over 50 Fellows. Presentations were given by the President, Interim Executive Director and Treasurer. 1. The minutes of the Annual General Meeting on 2 December 2014 were approved. 2. It was agreed to invite the Rt. Hon. Lord David Willetts and Professor Krishaswamy VijayRaghavan FRS to become Honorary Fellows of the Academy. 4. The audited accounts for 2014/15 were agreed and BDO LLP were appointed as auditors for 2016/17. 5. It was agreed that there would a small inflation-indexed adjustment in the Fellows’ subscription rates for 2016/17. 6. Professor Sir Robert Lechler was welcomed as new Academy President and Fellows recorded their formal thanks to Professor Sir John Tooke who demitted office at this meeting, following very four successful years as President during which the Academy has flourished under his inspired leadership. Click here to download the Academy's Annual Review. After the AGM, Lord Walton of Detchant and Mrs Maureen Foulkes-Hajdu presented the 2015 Foulkes Foundation Medal to Dr Nitzan Rosenfeld. Dr Rosenfeld will give the keynote lecture at the Academy’s Spring Meeting for Clinician Scientists in Training on 25 February 2016. Filmed footage of the Lecture will soon be available to view on the Academy’s YouTube channel. At a ceremony before dinner, Dr Dennis Gillings CBE FMedSci and Professor Peter Doherty FRS FMedSci were admitted to the Academy as Honorary Fellows and Sir John Tooke read a tribute for Professor Lisa Jardine CBE FRS FMedSci who sadly passed away before her formal admission to the Academy. Later in the evening, the Annual Fellows' Dinner - marking Sir John Tooke’s retirement as Academy President - was attended by approximately 130 Fellows and guests and the portrait of John, commissioned for the Academy offices, was unveiled. 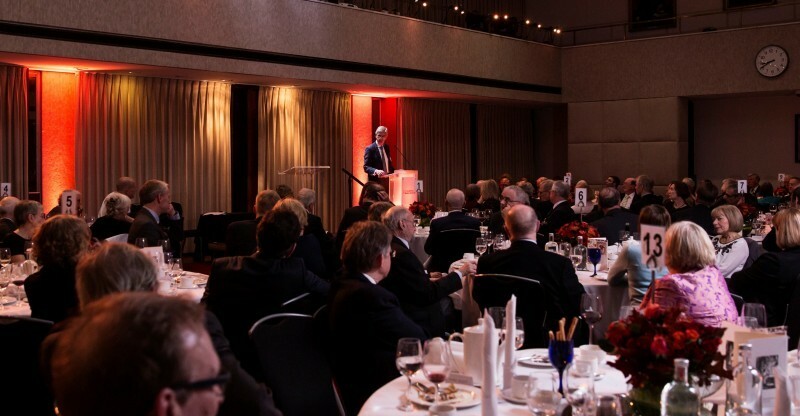 The Chief Medical Officer, Professor Dame Sally Davies, FRS FMedSci, gave the after-dinner speech in honour of Sir John Tooke, to thank him on behalf of the Academy Fellowship. Photos from the day are available to view on Flickr.